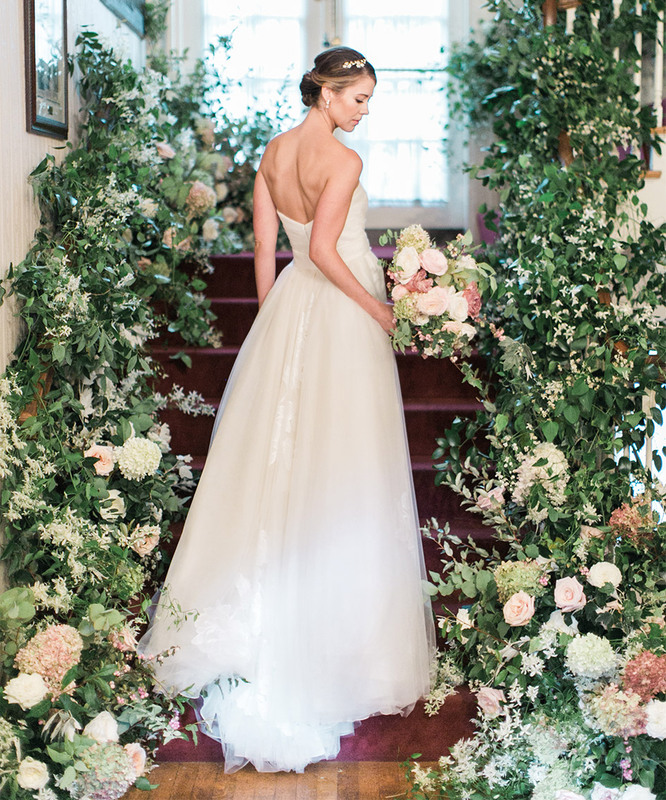 Looking to add an elegant touch to the grand stairwell of the Rainier Chapter House on Capitol Hill for their September 30, 2017 wedding, Caitlin King and Justin Minuk turned to wedding planner and florist Sinclair & Moore Events for an ultra-lush floral installation that not only matched the Southern garden party feel of their big day, but also gave extra life to a much-trafficked transition spot. “As we had to convert the main upper space in between the ceremony and reception, we wanted to make sure the stairs were especially inviting as the guests would be up and down them quite a few times,” says the bride. Beautifully bedecked with greenery and light, airy blooms that included garden roses, the finished installation spanned both sides and two floors of the spiraling stairs to lend themselves fetchingly to the big-day photos.